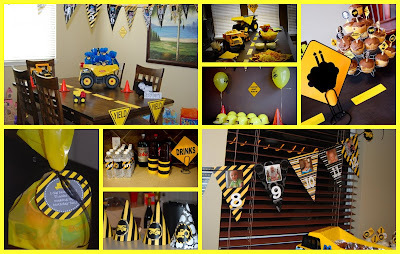 As you've probably seen in some of the party posts I've featured this month, you can really go crazy throwing your little one's birthday bash. 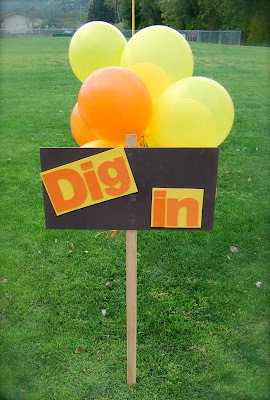 From construction parties featuring real equipment to full on circus tents (you'll see that post tomorrow! ), the sky's the limit these days. But sometimes, simple makes the biggest statement. That's what I love about the beautiful fabric buntings from Blue Moon Studios. They may not be flashy but they pack a big punch. They're double sided so you can display them anywhere and the fabric combinations are so fun! I can see this one hanging above a vintage tea party. 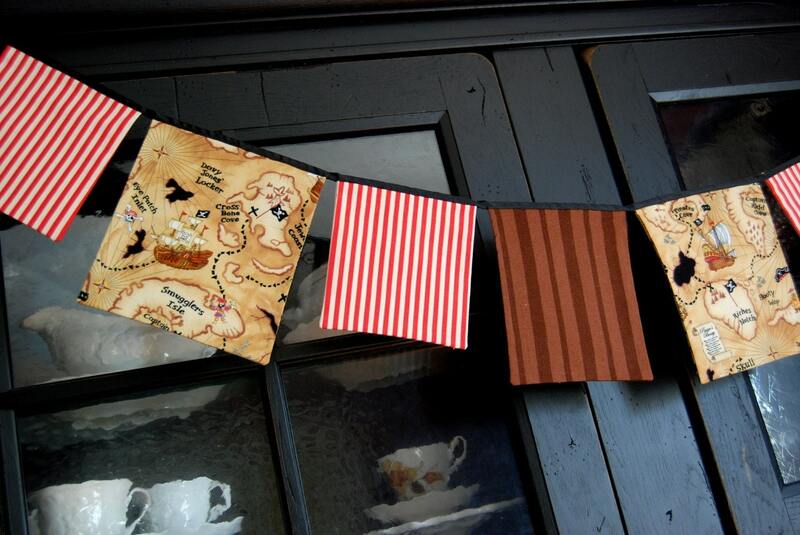 And how perfect would this set of flags be for a circus or carnival themed celebration? There's even something for pirate lovers. 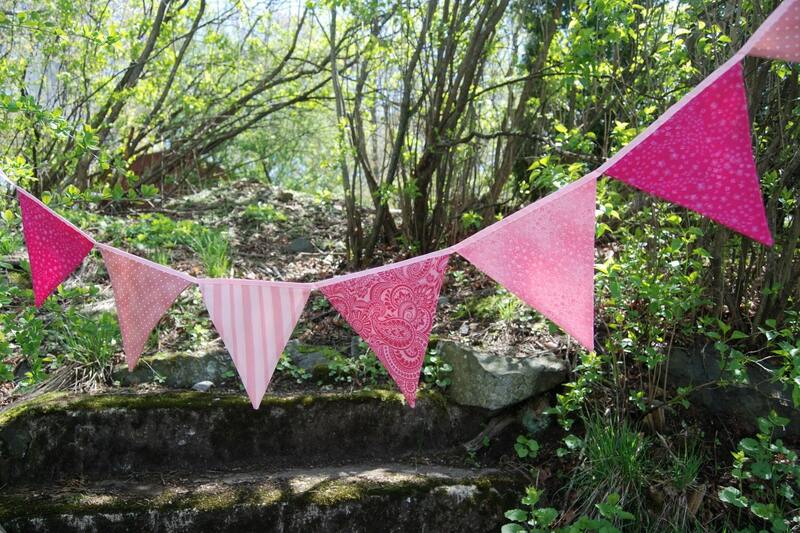 What I really adore about these buntings is the fact that they can be used long after the party has ended. You can hang them in a child's bedroom or playroom or pack them away until the next birthday comes along so you truly get some bang for your buck. There aren't too many party products out there you can say that about. 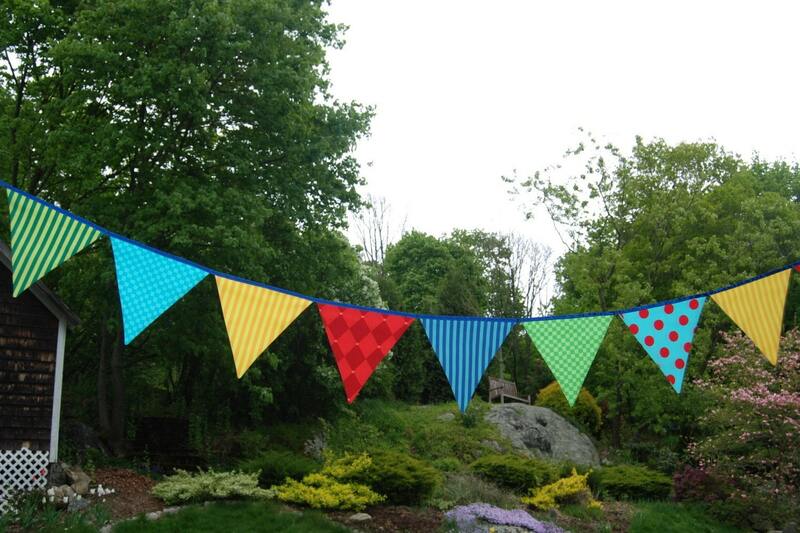 Blue Moon Studios will work with you to customize the perfect bunting for your bash and to enjoy long afterward. So in this case, the sky's the limit in a more economical and eco-friendly way! Visit Blue Moon Studios and make the store a favorite. Grab our new button and put it on your blog or website and post a link here showing us. Grab the PARTY PALOOZA button and put it on your blog or website and post a link here showing us. Blog about AFOMFT, PARTY PALOOZA or this giveaway (worth 2 entries so please post two comments) and post a link to the post. Please leave a separate comment for each entry (two if you've blogged about the giveaway) and make sure to include a link to your tweet, blog post, etc. This giveaway is open to residents of the U.S. and Canada and ends May 6th at 11:59 pm EST. The winner will be selected by random.org and announced on AFOMFT on May 7th. If the winner doesn't contact AFOMFT within 48 hours, a new drawing will be held so be sure to check back to see if you've won! What kid isn't mesmerized by construction sites? The crazy equipment, the big piles of dirt, the huge trucks.... It's all something they'd love to explore but are almost never allowed to. 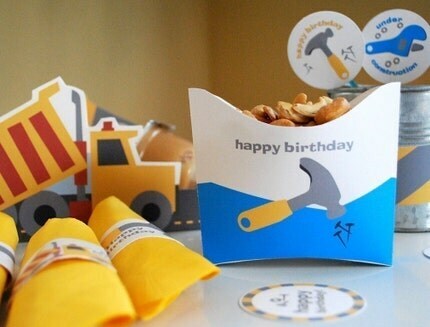 And that's exactly why throwing a construction-themed birthday bash is so much fun! Don't believe me? Just take a look at these fabulous fetes. First up is the amazing party Jessica of Juicy Bits threw for her son, Theo. The invitation from Tiny Prints established the color scheme (brown, orange and yellow) and theme from the start. I love the coordinating thank you notes and address labels! The day of the party, a wooden sawhorse barricade in the driveway pointed guests to the celebration site. 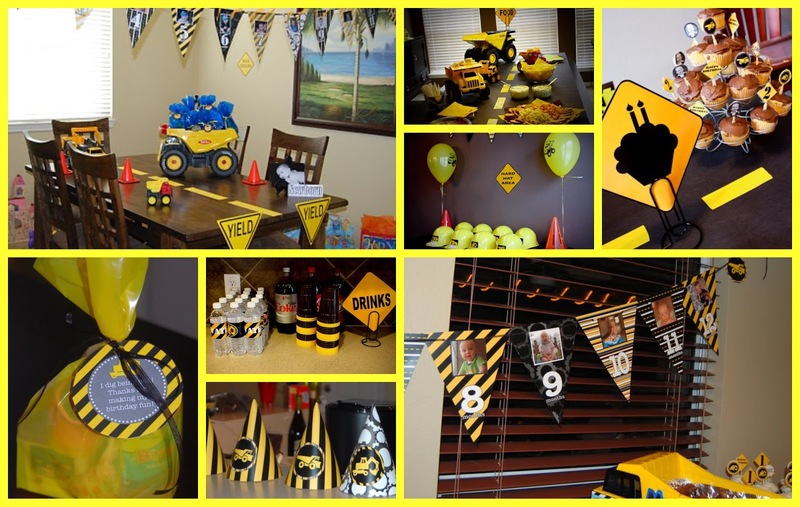 Inside the house, balloons were anchored by traffic cones, and toy trucks, construction signs, nuts and bolts and food in tin buckets and bowls were displayed on the table. And these terrific tool cookies Jessica made herself. The deck, where the kids' table was located, was festooned with huge balloons anchored again by cones. And each child's seat was designated by a personalized hard hat. They were perfect for the crew to wear while playing in the sand table. And a ride on this cool piece of equipment that a friend brought over as a surprise. Guests left with goodie buckets that were displayed below this fantastic fabric banner Jessica made for the occasion. The pails included a matchbox car, a sticker book and a construction puzzle. Along with a dump truck cookie. 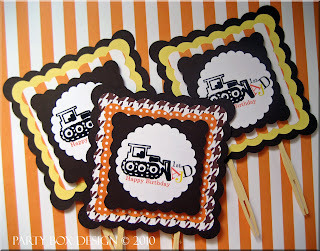 It's no wonder that Theo's birthday bash was one of the winners in the Most Adorable Kids Party of 2009 on Creative Hostess! For more pictures and design details, visit Juicy Bits. 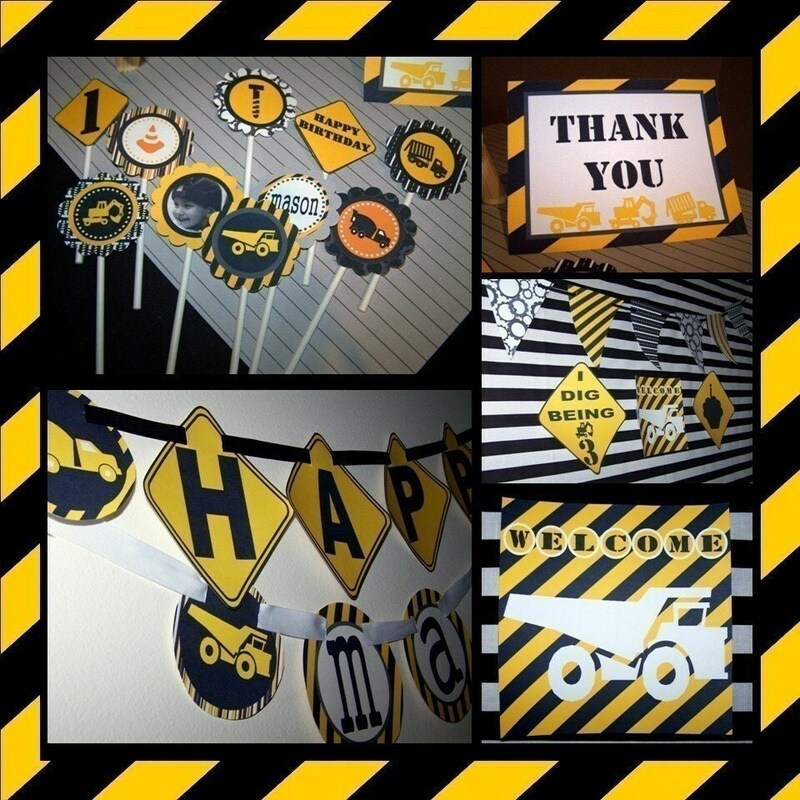 Creative Hostess recently featured another amazing construction celebration thrown by Christina for her son, Austin's first birthday. She used the same invitations Jessica did and created matching signs to welcome guests. 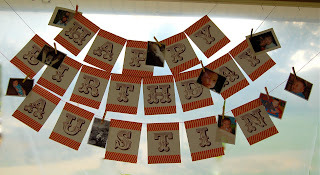 The fun birthday banner from Earmark Gatherings featured pictures of the birthday boy's first year. A huge dessert table included lots of yumminess, all in orange, yellow and brown. And the cupcakes had toppers from Party Box Design, who designed a really fun logo for the bash. 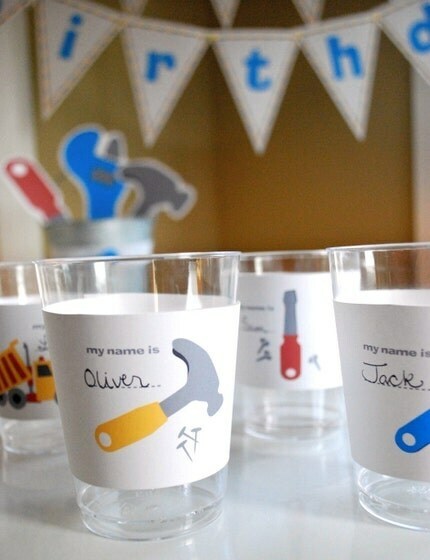 Centerpieces were vases of flowers with construction hats and toy trucks. Along with buckets of candy. The construction crew played in a sand pit until the rain forced them inside. But the goodie pails, topped with favor tags that matched the cupcake toppers, surely made up for it! For more pictures and details, visit the Dann Family Chronicles. A different Austin, this one the son of Heidi from Blue Eyed Blessings, had a construction celebration of his very own. How cute are these invitations? Cones and caution tape pointed arriving party goers in the right direction. The food table was highlighted by a Yield sign. And each worker got a "sack lunch." Heidi decorated the cupcakes by dying the frosting green, crumbling up Oreos for the dirt and then adding cones and trees she got from a cheap toy construction set. Now at Alan's "work" party, there was no break time. The active four year old loves to build so his mom. Nancy, from the fab blog CohabiTOT, "built" a birthday bash that I'm sure he'll never forget. See all those cardboard houses back there? That's what they looked like before Alan's construction crew got their hands on them. First, they donned their personalized hard hats and grabbed a laminated ruler. And then they got to work! Until they created the ultimate party shack. And then they ate cake. The Smiths threw their son Wyatt a construction party too and the creative DIY details are incredible. Check out the extension cord wreath on the front door! There was a sign in table with a construction book where guests could write messages to the birthday boy. And then they headed for the construction trailer. Inside, the ping pong table was wrapped in houndstooth paper and covered in lots of treats. And paint cans filled with candy. The bathroom was labeled appropriately. And the kid's table featured traffic cone cups (I have to figure out how she made them! ), along with a blueprint "tablecloth" the guests could color in. Wyatt's grandmother made the phenomenal cake which trucks were already "digging" into. And outside, the crew got to do some digging too. Are you inspired to start constructing a party of your own now? Well, here are some more ideas to add to your blueprints. Family Fun has a whole slew of great building basics. Instead of traditional invitations, why not create scrap wood invites instead? You can buy wooden craft rectangles at any craft supply store and use a ballpoint pen or carpenters' pencil to add the details like the where (or "Construction Site") and the host (or "Site Boss"). Let the kids re-fuel from tool boxes filled with snacks. Are you less of a DIY-er and more of a shopper? 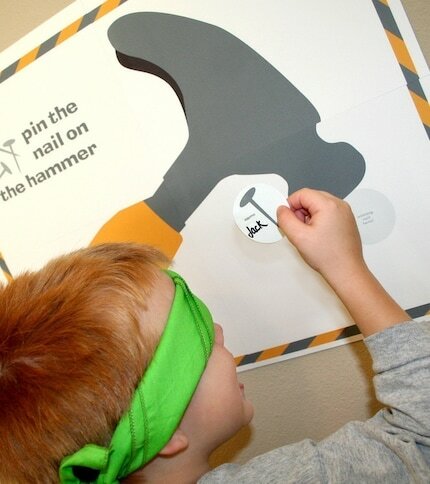 Then visit Dimpleprints for their Loads of Fun printable party package. Just $10 gets you the PDF files for more than 20 different party supplies. Everything from water bottle labels to food signs are included. 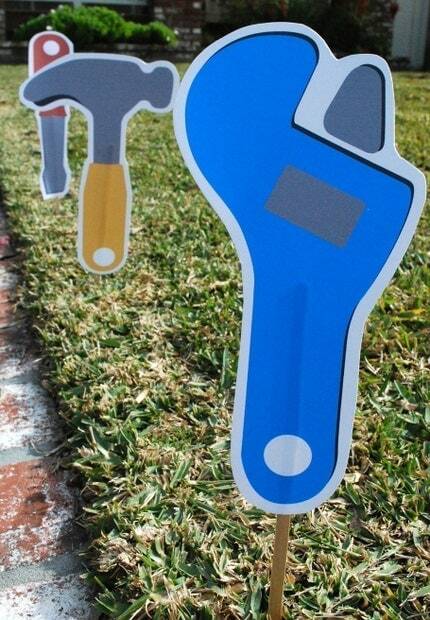 Just look at what Dimpleprints customers have done with their printables! 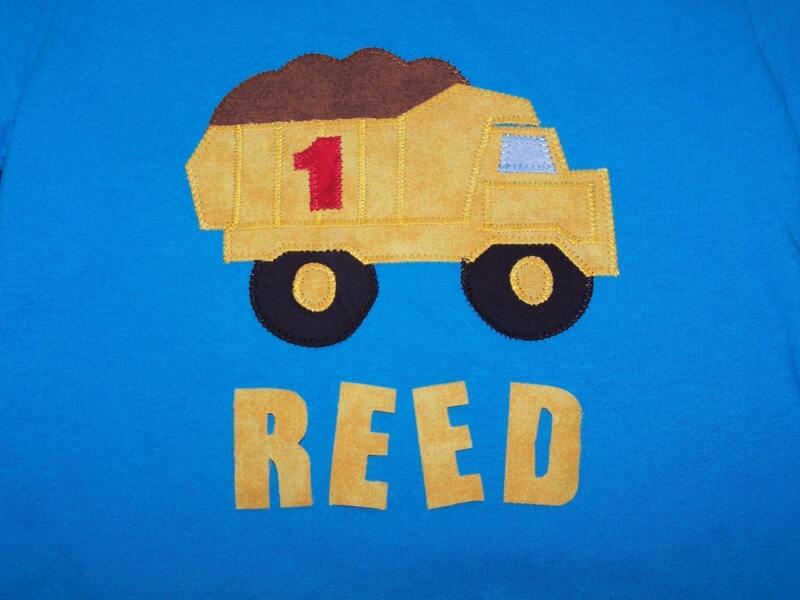 Your party foreman will need something to wear, so why not visit AFOMFT fave Ashley Alexander Boutique for a personalized dump truck shirt? 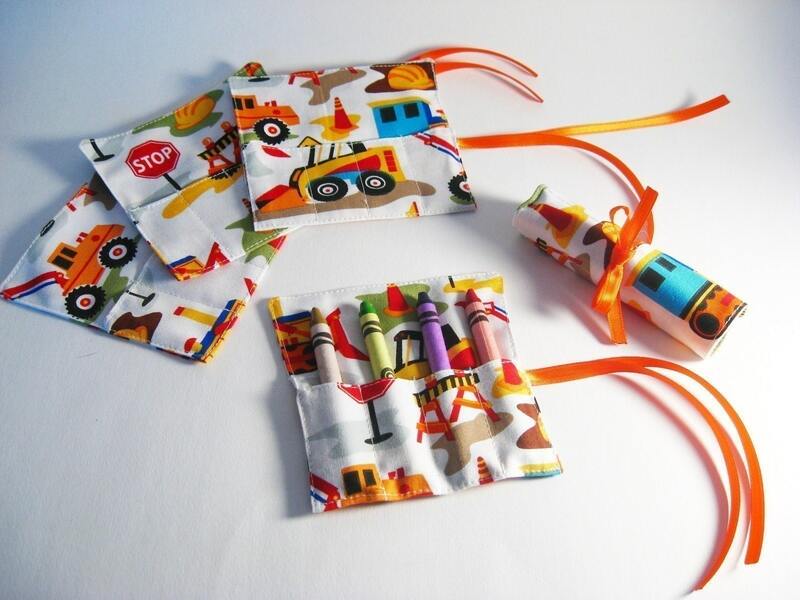 And when it comes to favors, add the Dig It mini crayon rolls from My Sunshine Designs to the crew's tool belts. 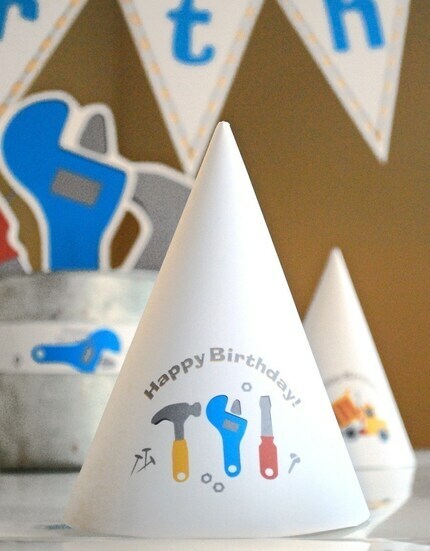 I hope I've given you some great tools to build the perfect party. Before you head off to start, though, be sure to visit the Goodies Page for great giveaways including one from My Sunshine Designs, who you read about in this post, as well as some terrific discounts!